When I take groups around Liverpool city-centre, I pause in front of Oriel Chambers on Water Street, and invite people to guess the date of the building. Most people get it wildly wrong, as I originally did, unless they’re sharp-eyed enough to spot the date high in the central gable. Oriel Chambers is a tall, elegant office-block, its framework picked out in nail-headed stone mullions which frame the delicate cast-iron windows which give it its name. It would do credit to an architect of the present generation: in fact it was completed in 1864 by a virtually unknown architect, Peter Ellis Jnr (1804-1884), who for his pains was virtually laughed out of the profession. Its inner courtyard (inaccessible to the public), faced with cantilevered iron cladding, even more uncompromisingly anticipates the Modern Movement. Except for one other framed building a couple of streets away, 16 Cook Street (1866), Ellis built hardly anywhere else. Oriel Chambers is also significant in engineering history because Peter Ellis installed the first ever example of a paternoster lift: http://www.bbc.co.uk/news/uk-england-leicestershire-42339097. The plainest brick warehouse in town is infinitely superior as a building to that large agglomeration of protruding plate-glass bubbles in Water Street termed Oriel Chambers. Did we not see this vast abortion – which would be depressing were it not ludicrous – with our own eyes, we should have doubted the possibility of its existence. Where and in what are their beauties [sic] supposed to lie? Ellis’ obituary in the Liverpool Daily Post (October 24th 1884) describes him as an architect and surveyor “held in high esteem by the members of his own profession” without mentioning a single building or design. It’s possible, however, that Ellis’ genius had a distant flowering. After the fall of Atlanta in 1864, an American planter with Liverpool business connections, Simon Root, sent his son to Liverpool for the duration of the American Civil War. The son was John Wellborn Root (1850-1891), who returned to the USA and became one of the leaders of the Chicago School of architects, responsible for the development of iron- and steel-framed buildings and the birth of the skyscraper in New York and Chicago . 1860s Liverpool wasn’t a big place by modern expectations. It’s unlikely that the young Root didn’t notice Ellis’ buildings and the fireproof warehouses that Jesse Hartley and George Fosbery Lyster had built along the river front. 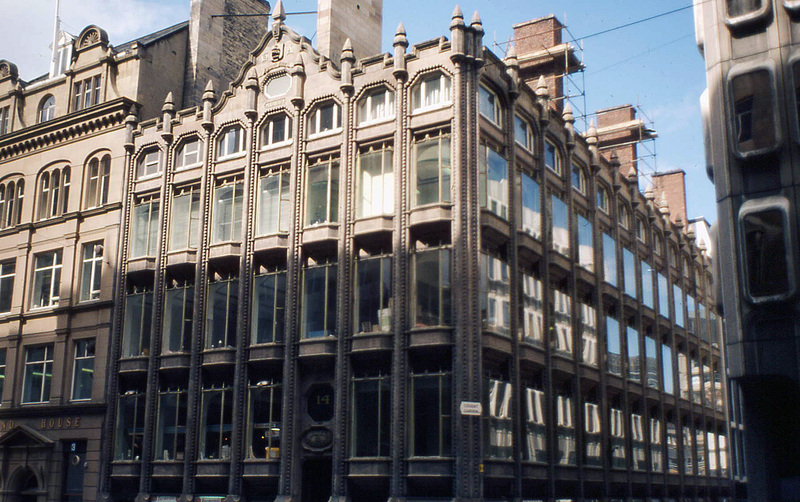 There’s no proof, but there’s a strong likelihood that the magnificent achievement of the Chicago School of architects may have a root in the Liverpool buildings that contemporary architects didn’t give the time of day. The first monograph on the life and work of Peter Ellis is Robert Ainsworth & Graham Jones, In the Footsteps of Peter Ellis (Liverpool History Society 2013). This entry was posted in Exploring Chicago, Liverpool's Heritage, Victorian Architecture on January 6, 2014 by Mike Higginbottom.